Although Deputy Attorney General Rod Rosenstein is the only person who can fire Russia Special Prosecutor Robert Mueller, Sean Spicer said Monday, "I get there may be a technicality as to whom reports to whom. But the bottom line is, is that everybody who is in a status of that serves at the pleasure of the President of the United States." What Spicer was suggesting: Trump can't directly fire Mueller, but he can fire Rosenstein. Why this matters: There has been a lot of discussion over the independence (or lack thereof) of Mueller's investigation. 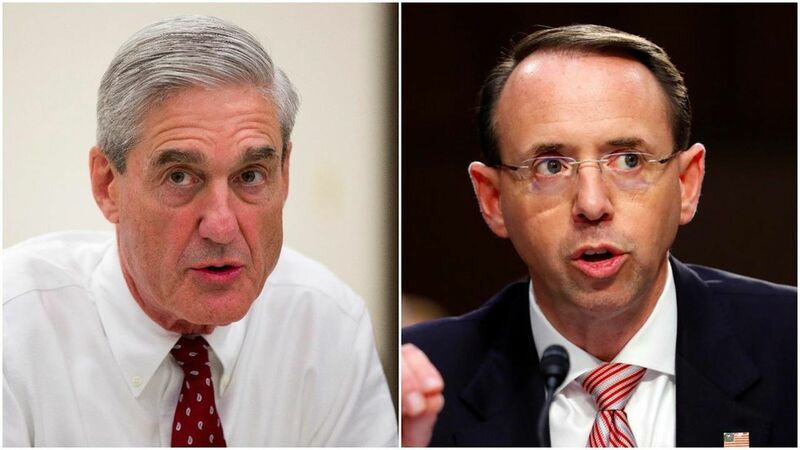 Rosenstein recently assured the Senate Intelligence committee that he would only fire Mueller if there was "good cause", regardless of Trump's orders. But Spicer is insinuating that the president can still determine the special counsel's fate. Does Trump have confidence in Rosenstein? "The President has confidence in everyone who serves him in this administration." Russia threatening to target U.S. planes in Syria: "We're going to do what we can to protect our interests... and keep the lines of communication open," said Spicer. He later added that the U.S. wants to de-escalate the tensions there, but "we will always preserve the right of self-defense." Did Trump tape Oval Office conversations? "It's possible we will have an answer to that by the end of the week." Progress of AHCA bill in Senate: The WH feels "very good" about the bill's progress, said Spicer. He later added that he doesn't know whether WH staff has seen text of the secret Senate bill. Why hasn't Trump said anything about the latest London terror attack? The president has been "made aware of the attack", and senior White House staff have been tracking the situation and are in contact with their British counterparts. Why is today's briefing off camera? "I've said it since the beginning -- the President spoke today, he was on camera. He'll make another comment today at the technology summit. And there are days that I'll decide that the President's voice should be the one that speaks, and iterate his priorities." Today's tech roundtable: Spicer said the goal of the WH is to give the tech sector "the most opportunity to create jobs" and stated the administration "will work with individuals regardless of what their past political beliefs are."